What is Palm Rolling ? Palm Rolling is used to help the new knots to get firm and tighten up. It helps new loose hair to become entangled in the dreadlocks. If the dreadlocks are made with the back combing method palm rolling works much better than twisting the hair around and around. To Palm roll take one or 2 dreadlocks between your palms and roll back and forth while scrolling pushing your hands against each other. Palm rolling works well anytime, but the best time to palm roll is when you have wax or gel in your dreads. A good dread wax will get your knots to compress and tighten up when you palm roles. They will tighten up more and more, until they are as tight as the hair will allow them to be. Normally, the hair will begin to loosen as soon as you stop palm rolling but wax will help the hair to keep this process for you repeat it. In between palm rolling sessions, the hair will be used to being pressured inside thee dreadlock. In the same way as in a braid hair gets used to be in a merge after a day or so. Once the hair has become accustomed to the position, it can be squeezed even tighter next time. 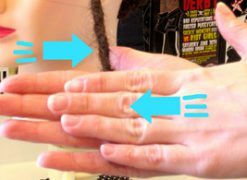 Because of the way Palm Rolling and dread wax works, I recommend trying to palm roll of each of your dreads for 30 seconds each time you get wax or gel in them. Of course it is not always possible, but give them a roll as often as you can. For maintaining dreadlocks palm roll your dreads as often you can. And after washing with shampoo its a perfect match to apply some tightening gel and palm roll. Palm rolling prevents loops and bumps and gives you beautiful tight dreadlocks. Se all products for tightening dreadlocks here!